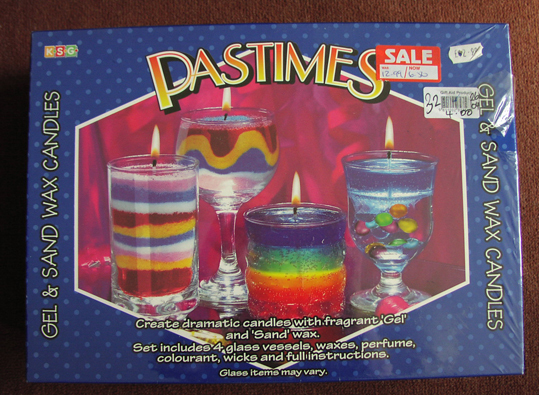 I found this candle making kit in a charity shop for £4 - pretty good value. I often look out for candle making kits being sold at charity shops and boot fairs because it can be an economical way of buying candle making supplies. What is a bit different about this kit is that it is for making gel and sand candles rather than ones from regular melted paraffin or soy wax. Inside were four glass containers (actually regular drinking glasses by the look of it), wick, sustainers, dyes, perfume, glass beads and enough wax to make two sand candles and two gel candles. As well as making a nice change for general mood lighting, gel and wax candles can be used for spells and magic and I'll be writing more about that at a later date. I had a look on on the internet to see if this particular kit is still being sold new, but couldn't find it. I did find a House of Crafts Gel Candlemaking Kit and a Candle Sand Making Kit for 2 Candles on Amazon.